1Department of Earth Sciences, Aichi University of Education, Kariya, Aichi, 448 Japan. 2Volcanological Division, Seismological and Volcanological Department, Japan Meteorological Agency, 1-3-4 Ote-machi, Chiyoda-ku, Tokyo, 100 Japan. 3Department of General Education, Kumamoto Institute of Technology, 4-22-1, Ikeda, Kumamoto, 860 Japan. Remarkable infrasonic waves produced by the Mount Pinatubo eruption of June 15, 1991, were recorded by the infrasonic observation system at Kariya, Japan, 2,770 kilometers to the northeast of the volcano. Waves which arrived 2 hours, 45 to 54 minutes after major eruptions are interpreted as the A1 waves, or the waves that propagated along the shorter great circle path in the atmosphere. A strong infrasonic signal lasting almost 10 hours was recorded from the climactic eruption of Mount Pinatubo on June 15. These data provide new information about the explosive sequence of the eruptions at its climactic stage. In addition, a weak and long-lasting wave train was recorded about 35 hours after the onset of the climactic stage. These waves arrived from the northeast and southwest and are interpreted as the A2 and A3 waves generated by the climactic eruptions. Acoustic-gravity waves were also recorded at five Japanese stations operated by the Japan Meteorological Agency. The complicated and elongated waveform indicates superposition of several wave trains excited by different explosions. The longest period of oscillation is 13.9 minutes, which is more than twice the longest period observed from the Mount St. Helens eruption in 1980. Tentative energy estimation based on the microbarographic data gave an explosive equivalent of approximately 70 megatonnes of TNT. Note to readers: Figures open in separate windows. To return to the text, close the figure's window or bring the text window to the front. The eruption of Mount Pinatubo in 1991 produced various oscillations both in the atmosphere and on the ground. Seismic disturbances lasting approximately 3 h were detected around the world (Kanamori and Mori, 1992; Widmer and Zürn, 1992; Zürn and Widmer, this volume). These waves have dominant periods at around 228 and 270 s, that have been interpreted by Kanamori and Mori (1992) as Rayleigh waves excited by acoustic coupling in the vicinity of the source. Traveling ionospheric disturbances were recorded in Taiwan (Cheng and Huang, 1992) and Japan (Igarashi and others, 1994). We will present in this paper atmospheric pressure waves detected in Japan. A large volcanic eruption can be a source of atmospheric pressure waves that propagate around the globe, as reported, for example, from the eruptions of Krakatau in 1883 (Simkin and Fiske, 1983), Bezymianny in 1956 (Passechnik, 1958), Mount St. Helens in 1980 (Donn and Balachandran, 1981; Sawada and others, 1982), and El Chichón in 1982 (Mauk, 1983). These waves are dispersive acoustic-gravity waves, composed of various modes that propagate in the atmosphere under the effects of gravity and compressibility. At the higher end of the spectrum there are infrasound waves, which propagate along acoustic rays determined by the temperature and wind profile in the atmosphere, almost free from the effect of gravitational force. Examples of such waves have been reported from eruptions of Mount Agung in 1963 (Goerke and others, 1965), of Alaskan volcanoes in 1966 through 1968 (Wilson and others, 1966; Wilson and Forbes, 1969), of Izu-oshima in 1986 and 1987 (Tahira and others, 1990), from a large number of summit explosions of Sakurajima volcano (Tahira, 1982, 1988a; Ishihara and others, 1986), and other volcanic eruptions in Japan (Tahira and others, 1988). Remarkable infrasound wave trains were detected by the observation system at Kariya located 2,770 km from Mount Pinatubo. Preliminary analysis (Kamo and others, 1994) shows an association of these waves with the volcanic activity. In this paper, the data recorded at Kariya will be presented in detail, and used to infer a time history of the volcanic activity, especially after the onset of the climactic stage on June 15, when visual and instrumental observations near the volcano were not possible due to the severe eruptions. Acoustic-gravity waves were recorded at five microbarographic stations in Japan from the climactic eruption of Mount Pinatubo. These waves have been briefly described by Igarashi and others (1992) and Tahira and Sawada (1992). Igarashi and others (1992) analyzed the acoustic-gravity wave data and compared them with the ionospheric events detected over Japan. In the present paper, the data will be analyzed in more detail and compared with the data recorded from the Mount St. Helens eruption in 1980. A tentative estimation of energy will also be attempted. Time is expressed in Philippine local time throughout the paper. A tripartite array of sensitive capacitor microphones is installed on the campus of the Aichi University of Education in Kariya, Japan (35.05°N. lat, 137.05°E. long). Kariya is 2,770 km northeast of Mount Pinatubo (fig. 1). 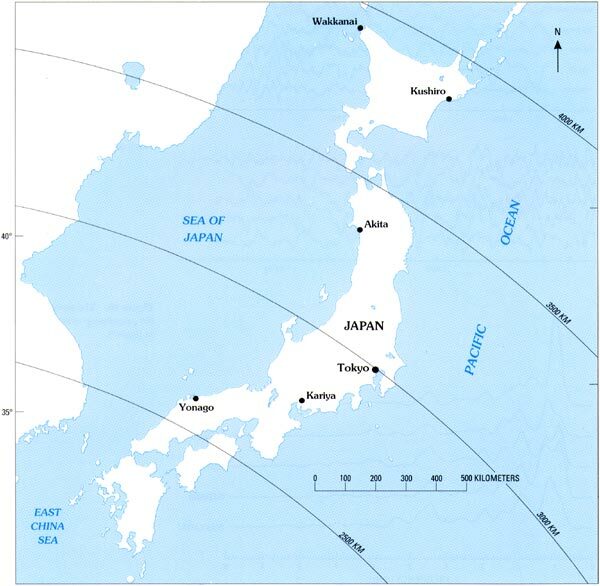 The map of the microphone array at Kariya is shown in the inset of figure 1. The frequency range of the microphones is 0.04-1 Hz. Detection of weak infrasonic signals in these frequencies is often made difficult by noise caused by atmospheric turbulence. A device to reduce the wind noise has been developed by Tahira (1981) and adopted in the observations at Kariya. This is a multi-pipe line microphone attached to the infrasonic sensor. The principle of this noise reducer is to take an average of the pressure fluctuations along a line to cancel out uncorrelated wind noise, and is similar to the one proposed by Daniels (1959). The shape, however, is different from the original device given by Daniels. Our line microphone consists of a number of parallel pipes of the same diameter, as schematically shown in figure 2, while Daniels' line microphone is a single pipe whose diameter changes stepwise at the inlet openings. Figure 1. Visible satellite images at 1440 and 1540 Philippine local time, on June 15, 1991. Figure 2. Schematic view of the multipipe line microphone used in the Kariya infrasonic system. Only a few pipes are drawn here for simplicity; the prototype has 13 pipes on each side and takes the spatial average of the pressure field over a length of 100 m.
Another source of noise is microbaroms, or acoustic waves released into the atmosphere by ocean waves in stormy regions (Donn, 1967; Donn and Naini, 1973). A stationary front called Baiu front was situated off the Pacific coast of the Japanese islands at the time of the Mount Pinatubo eruption, and low-pressure systems along the front were located to the east and west of Kariya. Microbaroms of considerable strength arrived from these directions and tended to mask the weak infrasonic signals from Mount Pinatubo. This background noise can be removed by using a numerical filter, since the pressure oscillations due to microbaroms are nearly monochromatic with dominant periods of 3 to 5 s, which are shorter than the infrasonic signals of interest. The output signals from the individual microphones are transmitted to one location by cables and continuously recorded on analog magnetic tape. The data for the time period from 1800 on June 13 through 1500 on June 17 were digitized with a sampling frequency of approximately 8.1 Hz. A numerical low-pass filter was applied to the digitized data to eliminate the noise due to microbaroms. The effect of the low-pass filter is to remove components of periods shorter than 6 s and retain the periods longer than 12 s, as shown by the dotted line in figure 3. 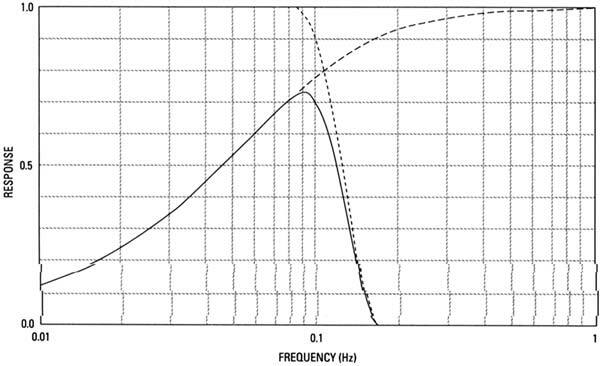 The dashed line in figure 3 shows the factory calibration of the response of the microphone, and the overall frequency response is given by the solid line. The sensitivity of the microphone has a maximum of 295 mV/Pa at a frequency of 0.09 Hz after numerical filtering, and this factor was used in the present analysis to convert voltage output to pressure change. Use of a constant conversion factor will cause underestimation in amplitudes for frequencies lower than 0.09 Hz, but no correction was made because amplification of lower frequency components will enhance not only infrasonic signals but also uncorrelated noise. Figure 3. The response function of the infrasonic system. The dashed line shows the factory calibration of the sensitivity of the microphone; the dotted line shows the response of the numerical filter applied to eliminate microbaroms. The overall effect is a band-pass filter as shown by the solid line. After applying the numerical filter, we computed the cross-correlation coefficients between all the pairs of the microphone outputs for 2-min time windows and averaged their maximum values over the three pairs. Traveling signals were identified when this averaged maximum cross-correlation coefficient reached some threshold. We adopted a value of 0.7 for this paper. The time lag that maximizes the correlation coefficient is taken as the optimum time lag of the traveling wave from one microphone site to another, and the direction of arrival was computed from the geometry of the tripartite microphone array. The arrivals of several wave trains were identified as a result of successive analysis of the data for every 2 min during the period mentioned above. We concentrate here on the waves arriving from the southwest and northeast quadrants because our interest is in infrasound generated by eruptions of Mount Pinatubo, which is located to the southwest of Kariya. The circles in figure 4 show the time and direction of arrivals of infrasonic signals from 1700 on June 14 through 1500 on June 17. The data before 1700 on June 14 are not presented here because there was no evidence that coherent wave trains arrived from the direction of interest. Five clear wave trains were recorded on June 15 and 16 from the southwest (see upper panel of figure 4). The average direction of arrival of these waves is 196.5° as measured clockwise from the north. This is 24.5° off the great circle bearings to Mount Pinatubo that is shown by the arrow at the right-hand edge of the figure. Figure 4. Sequence of arrivals of infrasonic signals at Kariya from 1700 on June 14 through 1500 on June 17. The abscissa of the data points indicates the time when the maximum cross correlation function was 0.7 or over, and the ordinate shows the direction of arrival. The lower panel of figure 4 indicates that clear infrasonic waves were recorded again on June 17. The directions are mostly in the east-northeast, but there are a considerable number of points in the southwest quadrant as well. These two directions are the antipodal and direct-path direction of Mount Pinatubo as shown by the arrows on the right of the panel. The onset time of these June 17 signals is not clear because of the sparsity of data at the beginning, but we can state that a continuous infrasonic wave train from the east-northeast started at 0110. This wave train lasted approximately for 9 h. The signal from the southwest is recorded intermittently from around 0300 on June 17 and overlaps with the signal from the northeast. The infrasonic events described above are referred to as signals A-F as shown in table 1. Waveforms of events A-F are reproduced in figure 5. High coherency among the three traces in each panel is clearly observed even by visual inspection, with one exception in signal D, where the coherence decayed suddenly around 0858. The decrease of coherence in signal D is due to the increase of irregular wind noise. The noisy condition at Kariya lasted more than 7 h until 1614 on the same day, when a strong signal was observable again, as illustrated in figure 5 (signal E). Signals A-C reveal quite similar characteristics, with durations of 34 to 36 min and maximum amplitudes 0.25-0.48 Pa (zero-to-peak). On the other hand, signals E and F produced oscillations lasting many hours, suggesting a continuous or repeated excitation at the source. Natures of these signals are summarized in table 1. Figure 5. Infrasonic signals recorded at Kariya from the eruptions of Mount Pinatubo on June 15. The three traces in each panel show the output of the three microphones of the tripartite array, as shown in figure 1. Table 1. Summary of the infrasonic signals observed at Kariya from the eruption of Mount Pinatubo on June 15, 1991. The temporal variation of the amplitude of the infrasonic waves is shown in figure 6. One can notice the sudden increase in the signal amplitude at 1627 on June 15 in figure 6. This is the onset of the largest activity of infrasonic disturbances recorded at Kariya. The strong signal frequently exceeding 1 Pa in amplitude continued to arrive for approximately 3 h and was followed by less intense waves until 0151 on June 16. The onset of the largest activity at 1627 on June 15 is also shown in figure 5 (signal E). The last signal (F) is long-lasting but small in amplitude, of the order of 0.1 Pa, as shown in figure 5 (signal F) and figure 6. Figure 6. Time sequence of the amplitude of infrasonic waves produced by the eruptions of Mount Pinatubo. The ordinate is the maximum amplitude observed in successive 2-min periods. The arrows indicate the time of major eruptions observed at Mount Pinatubo, and the dashed lines connect the onset of the infrasonic waves with the source eruption. The arrows in figure 6 indicate the eruption times of Mount Pinatubo as reported by PHIVOLCS (R. S. Punongbayan, written commun., 1991). The infrasonic signals A-D can be correlated with major eruptions of Mount Pinatubo, assuming a time lag of 2 h and 45 to 54 min, as shown by the dashed lines in figure 6. The abrupt increase of the amplitude of the infrasonic waves at 1627 on June 15 occurred 2 h and 45 min after the onset of the largest eruption at Mount Pinatubo, reported at 1342 (Smithsonian Institution, 1991; Punongbayan and others, 1992). The velocities calculated from these time lags and the distance between Mount Pinatubo and Kariya are 265 to 280 m/s (table 1). Tahira (1982, 1988a,b) has studied the propagation paths in the atmosphere of infrasonic waves generated by summit explosions of Sakurajima volcano, 710 km away from Kariya, and has shown that three types of sound channels exist, depending mainly on the vertical profile of wind components along the direction of propagation. The lowest channel is formed between the ground surface and upper troposphere when strong winds are blowing in the direction of propagation at upper tropospheric heights. The velocity in such cases is nearly the same as the speed of sound at the surface, or 340 to 350 m/s. Infrasonic signals can also be channeled between the upper stratosphere and the ground in the presence of tail winds in the upper stratosphere, and the empirical value of the travel speed for such waves is approximately 310 m/s. The apparent speed is reduced further when acoustic waves are refracted back toward the ground in the thermosphere, say, above 110 km, giving rise to values 260 to 280 m/s (Tahira, 1988a,b). Both the troposphere and the stratosphere in the Northern Hemisphere were in a summer regime at the time of Mount Pinatubo eruption in 1991, with weak westerlies in the troposphere and stable easterlies in the stratosphere at middle latitudes. Therefore, the only acoustic duct to propagate infrasound directly from Mount Pinatubo to Kariya was that formed between the lower thermosphere and the ground. Thus, the computed velocities of the signals A-E (table 1) coincide well with the empirical values for long-range infrasonic waves. We can conclude that the sources of the signals in question are indeed the eruptions of Mount Pinatubo (dashed lines in fig. 6). These waves are so-called A1 waves, or the waves propagated essentially along the shorter great circle path. The weak wave train (F) mostly arrived from the direction of northeast, which is close to the antipodal direction of Mount Pinatubo as shown by the arrow in lower panel of figure 4. Therefore, this signal is inferred to be the A2 wave, or the wave propagated via an antipodal great circle path to Kariya, which originated by the climactic eruptions of Mount Pinatubo starting at 1342 on June 15. The deviation of the arrival direction from the antipodal bearing is of the order of a few tens of degrees and almost the same as for the cases of the A1 waves (A-E) for the direct path. The propagation velocity of the A2 wave was 291 m/s, taking 0110 on June 17 as the onset time of the signal (F). This is a little faster than the speed obtained for signals A-E but is still reasonable for long-distance propagation of infrasonic waves and thus supports a Mount Pinatubo source and an antipodal path. Figure 4 shows another wave train arriving from the southwest and overlapping with the antipodal wave train discussed above. We suggest this is the A3 wave, which is the A1 wave from the climactic eruptions of Mount Pinatubo that traveled once around the globe. The direction of arrival roughly coincides with the direction of Mount Pinatubo as shown by the arrow in lower panel in figure 4. Since the travel path of the A3 wave is only 15 percent longer than that of the A2 wave, we would expect the amplitude to be roughly the same. The velocity is 314 to 319 m/s, taking the onset time of the signal as 0300 to 0330 on June 17. The velocities of both the A2 and A3 waves are somewhat higher than the empirical values for waves propagating in the thermospheric wave duct. Figure 7 shows the Mercator projection of the great circle passing through Mount Pinatubo and Kariya. The stratospheric zonal winds for June in mid-latitudes are also shown by the thick arrows in figure 7. It is inferred from this figure that the A2 waves were channeled in the stratospheric acoustic duct while propagating in mid-latitudes of the Northern Hemisphere, where easterly winds prevail in the stratosphere. Likewise, the A3 waves must have traveled through the stratospheric duct in mid-latitudes of the Southern Hemisphere, where the stratospheric prevailing winds are westerlies. The higher velocities of the A2 and A3 waves are thus interpreted by the propagation in the stratospheric duct in some part of the great circle paths. Furthermore, the winter stratospheric westerlies in the Southern Hemisphere are generally stronger and extend to lower altitudes than the summer easterlies in the Northern Hemisphere (for example, figure 12.3 of Holton, 1992). Thus, the A3 waves could be reflected at lower altitudes, say 20 to 30 km, while the A2 wave must have gone up to 40 to 50 km to be reflected back toward the ground. The higher apparent velocity of the A3 waves is partly explained by the stratospheric wind structure. In conclusion, we can infer that signal F is a composite of A2 and A3 wave trains generated by the eruptions of Mount Pinatubo in its climactic stage. Figure 7. The Mercator projection of the great circle passing through Mount Pinatubo and Kariya. The thick arrows show the stratospheric prevailing winds in June in mid-latitudes. A long train of acoustic-gravity waves was recorded at five microbarographic stations in Japan (Wakkanai, Kushiro, Akita, Tokyo, and Yonago), which are operated by the Japan Meteorological Agency (Igarashi and others, 1994; Tahira and Sawada, 1992). The locations of the microbarographic stations are shown in figure 8, where the arcs indicate the distance from Mount Pinatubo. Since the microbarographic data were provided only as paper records, we digitized the data at a sampling period of 3 s for detailed analysis. Figure 8. Locations of the microbarographic stations in Japan. The arcs show the distance from Mount Pinatubo. The recorded waveform is reproduced in figure 9 after applying a high-pass filter to eliminate the incoherent noise with periods longer than 34 min and retain periods shorter than 17 min. 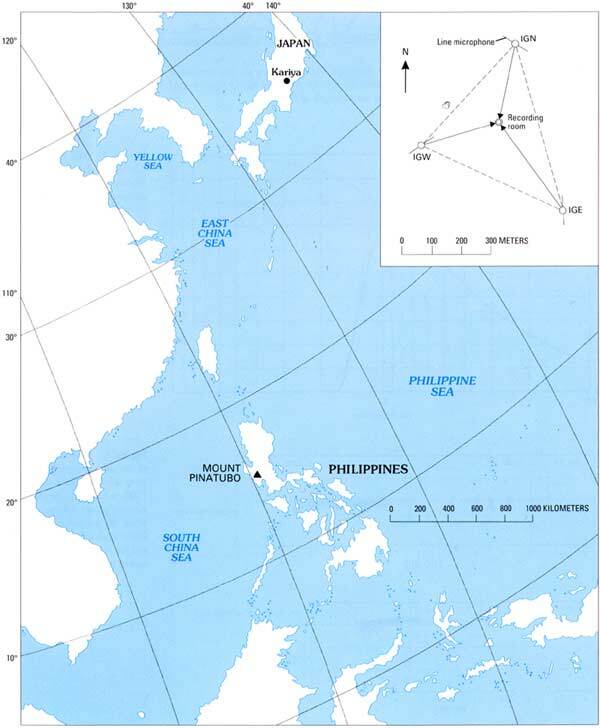 The indicated time in figure 9 corresponds to the record at Tokyo (in Philippine local time). The time axes of other traces were shifted appropriately to get the best phase match with each other. Coherent waves are noticed from 1603 through 1950 on June 15. The propagation speed computed from the time shift is 300 m/s, assuming the waves propagated from the direction of Mount Pinatubo. The group velocity of the leading part of the wave is computed as 354 m/s, if we assume that this wave train was produced by the eruptions starting at 1342 on June 15. This is a little faster than the theoretical prediction of acoustic-gravity waves as given, for example, by Harkrider (1964). However, the waves recorded after 1618 have a reasonable group velocity, 320 m/s if associated with the eruptions after 1342. Therefore, the disturbances shown in figure 9 are very likely the acoustic-gravity waves produced by the climactic eruptions of Mount Pinatubo on June 15, 1991. Figure 9. Microbarographic waves observed at five stations in Japan on June 15, 1991. The data were numerically filtered in order to eliminate the uncorrelated low-frequency noise with periods longer than 34 min. The time axis corresponds to the record at Tokyo, and the traces at other stations were shifted to obtain the best phase match with each other. The waveform is somewhat complicated and looks quite different from the acoustic-gravity waves normally observed from large volcanic explosions, such as the eruption of Mount St. Helens in 1980 (Donn and Balachandran, 1981; Sawada and others, 1982). This is interpreted as being due to the superposition of several acoustic-gravity wave trains excited by different explosions. Power spectra of the acoustic-gravity waves are shown in figure 10. Common spectral peaks are noticed at the frequencies 1.2, 1.9, 2.4, 2.9, and 4.4 mHz. The corresponding periods are 13.9, 8.8, 6.9, 5.7, and 3.8 min, respectively. The waves from Mount Pinatubo contain oscillations with much longer periods than those recorded from the Mount St. Helens eruption in 1980, for which the reported longest period is 6.5 min (Donn and Balachandran, 1981). Figure 10. The power spectra of the microbarographic data shown in figure 9.
where E is the energy release in explosive equivalent of TNT (megatonnes), P the first peak-to-peak amplitude (pascals), R the radius of the Earth (meters), l the great circle distance between the source and receiver (meters), H the lower atmospheric scale height (meters), c the representative sound speed (meters per second), and the time interval (seconds) between the first and second peaks. We attempted to estimate the source energy of the Mount Pinatubo eruptions by applying this method to the recorded acoustic-gravity waves. Application of this method requires identification of the leading part of individual wave trains in the microbarogram. We do not have any objective means at present to separate one wave train from another. One possible way is to apply a numerical low-pass filter to the records, since the acoustic-gravity waves at great distances are highly dispersive, with the lowest frequency component normally arriving first. We expect from the spectral analysis (fig. 10) that the leading portion of the wave trains from significant explosions have periods longer than about 8 min, so that we applied a numerical filter which suppresses periods shorter than 4 min and gradually decreases that suppression until it retains the whole signal for periods longer than 8 min. The resulting low-pass filtered signals are shown in figure 11. Figure 11. Microbarographic records after applying a low-pass filter that increasingly attenuates wave components with periods of 8 min down to 4 min and wholly eliminates wave components with periods shorter than 4 min. Components with periods longer than 8 minutes are not attenuated. The filtered waveform suggests onsets of the new oscillations at around 1603, 1715, 1750, 1835, and 1858. In particular, two large waves are noticeable at 1835 to 1855 and 1858 to 1920. We calculated the source energy for these waves, assuming that these portions of the wave packet indicate the arrival of a new wave train, and obtained explosive equivalent of 27.2 and 21.1 MT of TNT. Both of these values are smaller than the energy of the Mount St. Helens eruption in 1980, which was estimated by use of the same technique as 35 MT (Donn and Balachandran, 1981). However, the total energy release, if one integrates the results for other portions of the microbarogram mentioned above, amounts to about 70 MT, and this is twice the energy of the Mount St. Helens eruption in 1980. It is of interest to compare the infrasonic signals with the acoustic-gravity waves from the climactic eruptions of Mount Pinatubo, since there have been very few occasions that both the infrasonic and acoustic-gravity waves are recorded simultaneously at long distances. High amplitudes of infrasonic waves lasted about 3.5 h (fig. 6), and this duration roughly coincides with the duration of acoustic-gravity waves (about 3 h and 50 min, fig. 9). It is also consistent with the barogram obtained at Clark Air Base (Kanamori and Mori, 1992). However, apparent inconsistency is noticed between the fine structure of infrasonic amplitudes and acoustic-gravity waves. The acoustic-gravity waves in figure 11 suggest arrival of the strongest disturbance at around 1835 at Tokyo. The corresponding arrival time of infrasonic waves at Kariya should be 1854, assuming that the infrasonic waves starting at 1627 correspond to the acoustic-gravity waves starting at 1618. The infrasonic amplitude is large indeed at around 1854, but it is not the largest at this time. This fact suggests different source mechanisms for different types of waves. It should be noted, however, that some ambiguity is included in the infrasonic amplitudes. For example, focusing or defocusing of acoustic rays at the observation site is one of the causes of amplitude variations. Attenuation of infrasonic waves due to viscosity of air becomes more and more serious for waves reflected at higher altitudes in the thermosphere, and the reflection level in turn can be controlled by the atmospheric tidal winds (Donn and Rind, 1972). Since the atmospheric tidal oscillations are highly variable (Tsuda and others, 1983), and no observations were available on the tidal conditions at the time of Mount Pinatubo eruption, some ambiguity in the infrasonic amplitudes is unavoidable. Therefore, discussion based on the fine structure of the amplitude sequence may not be adequate, although the amplitude envelope in figure 6 is a good indication of the explosive sequence of Mount Pinatubo eruptions. Some other problems regarding the observation of infrasonic waves were left unresolved. It is shown in figure 4 that the direction of arrival of the infrasonic signals does not strictly coincide with the great circle direction to Mount Pinatubo. One possible explanation is that small errors in time lags at the tripartite array could result from different phase characteristics of the electronics. A small error in time lags can produce a relatively large shift in the determination of the direction of arrival, because the dimension of the tripartite at Kariya is small compared to the wavelength of the infrasonic signals in question. Deflection of the direction of arrival from the great circle bearings can also result from lateral winds in the propagation paths, especially when the source-receiver distance is large. For example, a direction deflection of 40° was observed for infrasonic waves from the eruption of Mount Agung in 1963 at North American stations (Goerke and others, 1965). 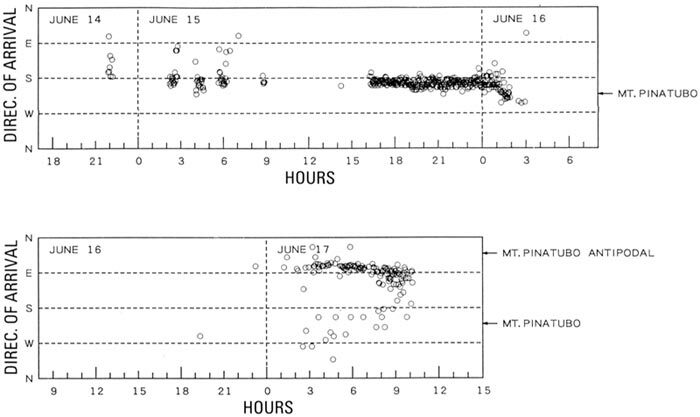 A number of eruptions are reported from 0556 through 1342 on June 15, as indicated by the arrows in figure 6. Unfortunately, none of these were detected at Kariya because of the strong wind noise. Wind noise is reduced considerably by the line microphone, but infrasonic signals are still apt to be masked under severe wind conditions. The eruption energy was estimated by using the acoustic-gravity waves recorded in Japan. Some ambiguity remains, however, in the separation of wave trains; we evaluated here energy for only five apparent wave trains, but it is somewhat difficult to pick all the wave trains from the records. Therefore, the resulting energy estimation should be taken as a minimum of the released energy. A more comprehensive technique will be required for more accurate estimation of the eruption energy, also using the microbarographic records. It is interesting to note that the power spectra of the acoustic-gravity waves recorded in Japan (fig. 9) clearly show oscillations at a frequency of 4.4 mHz, which coincides with the frequency of the Rayleigh waves widely recorded from Mount Pinatubo eruptions (Kanamori and Mori, 1992; Widmer and Zürn, 1992; Zürn and Widmer, this volume). This fact supports the excitation mechanism of the Rayleigh waves proposed by Kanamori and Mori (1992) and Zürn and Widmer (this volume), stating that the atmospheric oscillations set off by the eruption of Mount Pinatubo are the cause of these peculiar Rayleigh waves. It is not clear at present, however, why the Earth's atmosphere oscillates at this particular frequency; it is somewhat larger than the Brunt-Väisälä frequency (3.3 to 3.5 mHz) in the lower stratosphere. Resonant interaction of the waves due to the nonlinear effect (for example, Yeh and Liu, 1970) could be a possible mechanism, but details are left for future studies. The eruption of Mount Pinatubo on June 15, 1991, produced remarkable infrasonic and acoustic-gravity waves, both of which were recorded by ground-based observation systems in Japan. Several infrasonic wave trains recorded at Kariya, 2,770 km from Mount Pinatubo, were clearly associated with reported eruptions. In particular, infrasonic signals of large amplitudes, often exceeding 1 Pa, were recorded starting at 1627 on June 15 and lasted for approximately 3.5 h. These strong signals were then followed by less intense, but continuous, waves which lasted until 0151 on June 16. These signals provide information describing the explosive sequence of the volcanic activity at its climactic phase, at a time when most visual and instrumental observations near the volcano were interrupted due to the severe eruption. Detailed analysis of the infrasonic record at Kariya indicated the arrival of weak and long-lasting infrasonic waves from the northeast and southwest quadrants, approximately 35 hours after the onset of the climactic eruption. These waves are inferred to be a composite of A2 and A3 waves. Acoustic-gravity waves recorded at five meteorological stations in Japan were also associated with the climactic eruption of Mount Pinatubo. The duration of the waves is 3 h and 50 min and is comparable to the duration of strong infrasonic signals at Kariya. The longest period obtained from the spectral analysis is 13.9 min, which is more than twice the longest period observed from the Mount St. Helens eruption. The waveform is complicated because of superposition of several wave trains excited by different explosions. An energy estimation of the eruptions was made after identifying the leading part of individual acoustic-gravity wave trains by applying a low-pass numerical filter. The source energy was estimated to be the explosive equivalent of approximately 70 MT of TNT. This is taken as a minimum of the released energy but is twice as large as that released from the Mount St. Helens eruption in 1980. The authors are grateful to the Japan Meteorological Agency for furnishing the microbarographic data. They also thank J. Mori, J. Kienle, C.G. Newhall, and J.S. Oswalt for reviewing the original draft and giving invaluable comments. Cheng, K., and Huang, Y.-I., 1992, Ionospheric disturbances observed during the period of Mount Pinatubo eruptions in June 1991: Journal of Geophysical Research, v. 97, p. 16995-17004. Daniels, F.B., 1959, Noise-reducing line microphone for frequencies below 1 cps: Journal of the Acoustical Society of America, v. 31, p. 529-531. Donn, W.L., 1967, Natural infrasound of five seconds period: Nature, v. 215, p. 1469-1470. Donn, W.L., and Balachandran, N.K., 1981, Mount St. Helens eruption of 18 May 1980: Air waves and explosive yield: Science, v. 213, p. 539-541. Donn, W.L., and Naini, B., 1973, Sea wave origin of microbaroms and microseisms: Journal of Geophysical Research, v. 78, p. 4482-4488. Donn, W.L., and Rind, D., 1972, Microbaroms and temperature and wind of the upper atmosphere: Journal of Atmospheric Science, v. 29, p. 156-172. Goerke, V.H., Young, J.M., and Cook, R.K., 1965, Infrasonic observations of the May 16, 1963, volcanic eruption on the Island of Bali: Journal of Geophysical Research, v. 70, p. 6017-6022. Harkrider, D.G., 1964, Theoretical and observed acoustic-gravity waves from explosive sources in the atmosphere: Journal of Geophysical Research, v. 69, p. 5295-5321. Holton, J.R., 1992, An Introduction to Dynamic Meteorology (3d ed. ): Academic Press, 507 p.
Igarashi, K., Kainuma, S., Nishimuta, I., Okamoto, S., Kuroiwa, H., Tanaka, T., and Ogawa, T., 1992, Ionospheric disturbances over Japan caused by the eruption of Mount Pinatubo on June 15, 1991: Proceedings, International Symposium on Middle Atmosphere Science, Kyoto, p. 219-220. ------1994, Ionospheric and atmospheric disturbances around Japan caused by the eruption of Mount Pinatubo on June 15, 1991: Journal of Atmospheric and Terrestrial Physics, v. 56, p. 1227-1234. Kamo, K., Ishihara K., and Tahira, M., 1994, Infrasonic and seismic detection of explosive eruptions at Sakurajima Volcano, Japan, and the PEGASAS-VE early warning system, in Casadevall, Thomas, ed., Proceedings, First International Symposium on Volcanic Ash and Aviation Safety: U.S. Geological Survey Bulletin 2047, p. 357-365. Kanamori, H., and Mori, J., 1992, Harmonic excitation of mantle Rayleigh waves by the 1991 eruption of Mount Pinatubo, Philippines: Geophysical Research Letters, v. 19, p. 721-724. Mauk, F.J., 1983, Utilization of seismically recorded infrasonic-acoustic signals to monitor volcanic explosions: The El Chichón sequence 1982--A case study: Journal of Geophysical Research, v. 88, p. 10385-10401. Posey, J.W., and Pierce, A.D., 1971, Estimation of nuclear explosion energies from microbarographic records: Nature, v. 232, p. 253. Punongbayan, R.S., Newhall, C.G., and Listanco, E.L., 1992, Brief notes on the 1990-1991 Pinatubo volcano events and corresponding scientific responses: Bulletin of the Volcanological Society of Japan, v. 37, p. 55-59. Simkin, T., and Fiske, R.S., 1983, Krakatau 1883, The volcanic eruption and its effects: Washington, Smithsonian Institution Press, p. 367-395. Smithsonian Institution, 1991, Pinatubo: Bulletin of the Global Volcanism Network, v. 16, no. 5, p. 2-8. Tahira, M., 1981, A study of the infrasonic wave in the atmosphere. Multi-pipe line microphone for infrasonic observation: Journal of the Meteorological Society of Japan, v. 59, p. 477-486. ------1982, A study of the infrasonic wave in the atmosphere. II, Infrasonic waves generated by the explosions of the volcano Sakura-jima: Journal of the Meteorological Society of Japan, v. 60, p. 896-907. ------1988a, A study of the long range propagation of infrasonic waves in the atmosphere. I, Observation of the volcanic infrasonic waves propagating through the thermospheric duct: Journal of the Meteorological Society of Japan, v. 66, p. 17-26. ------1988b, A study of the long range propagation of infrasonic waves in the atmosphere. II, Numerical study of the waveform deformation along thermospheric ray paths: Journal of the Meteorological Society of Japan, v. 66, p. 27-37. Tahira, M., Ishihara, K., and Iguchi, M., 1988, Monitoring volcanic eruptions with infrasonic waves: Proceedings of the Kagoshima International Conference on Volcanoes, Tokyo, National Institute for Research Advancement, and Kagoshima, Kagoshima Prefectural Government, p. 530-533. Tahira, M., and Sawada, Y., 1992, Pressure waves produced by the Mt. Pinatubo eruptions of 15 June 1991: Proceedings, Annual Meeting of the Volcanological Society of Japan, p. D31-P85. Tsuda, T., Aso, T., and Kato, S., 1983, Seasonal variation of solar atmospheric tides at meteor heights: Journal of Geomagnetism and Geoelectricity, v. 35, p. 65-86. Yeh, K.C., and Liu, C.H., 1970, On resonant interactions of acoustic gravity waves: Radio Science, v. 5, p. 39-48. Wilson, C.R., Nichparenko, S., and Forbes, R.B., 1966, Evidence of two sound channels in the polar atmosphere from infrasonic observations of the eruption of an Alaskan volcano: Nature, v. 211, p. 163-165. Wilson, C.R., and Forbes, R.B., 1969, Infrasonic waves from Alaskan volcanic eruptions: Journal of Geophysical Research, v. 74, p. 4511-4522. Widmer, R., and Zürn, W., 1992, Bichromatic excitation of long-period Rayleigh and air waves by the Mount Pinatubo and El Chichon volcanic eruptions: Geophysical Research Letters, v. 19, p. 765-768. Zürn, W., and Widmer, R., this volume, Worldwide observation of bichromatic long-period Rayleigh waves excited during the June 15, 1991, eruption of Mount Pinatubo.